A headless installation is now possible as well. I've put together an easy to install version of Fatdog Arm Beta 4.
operating system that is reasonably fast. Format your micro SD card as fat32 using a windows or linux formatter. just do "dd if=/dev/zero of=/dev/<flash-drive-device-name> bs=1M count=1". After doing this Gparted will regard you flash drive as completely empty and will offer to create a new MS-DOS partition table - which you should accept. A quick formating to fat32 is all that is needed. Open up fatdogarm-pi2-03-15-2018.zip. You will see some files and folders inside a folder. Drag the contents of the folder to a freshly formatted (fat32) micro SD card. ethernet cable and a wireless adapter. While booting ---> the OS asks for a save file , just press the <ENTER> key. The operating system will automatically find the fatdog save file. Note that user's documents and config files are in that save file. 5) You will soon see the desktop with a giant clock on it. Set your wlan with the tray app. Tip: Type 'ifconfig' in terminal to check if a network address has been assigned. I checked the boot messages to see if the driver had loaded. carl9170 is the name of my driver, so it has loaded. Good! Type 'ifconfig' in terminal and wlan0 will have a network address assigned to it now. It is different than ethernet address. Fill in the address of server and the Share name. You can turn your raspberry pi2 computer into a server. Fill this address into the fatdog app. 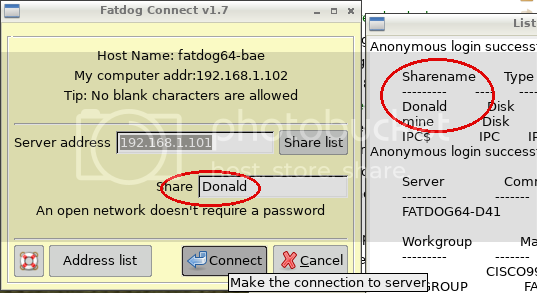 To find the share name, click the Fatdog connect 'Help' button for some tips. Thanks, bookmaked for later. I have an rpi2 on order... I was just wondering if there's any subjective speed comparison between FD arm and Rasbian. The OS I was running didn't have big enough on-screen text when using my 32-inch flat-screen TV as a display. Unable to clearly read it with my sub-standard eyesight from across the room when using my wireless keyboard and mouse. How big is the text in this Puppy OS? I don't know about text size, but I know this OS can't run on rpi B+, I asked the same question in another thread. I've just installed your latest fdarm on an 8GB mico SD card. This booted up OK. However, when closing down I had some difficulty in making a save file. Everything worked OK until I got to the screen that allows you to check the choises you have previously made. When I clicked on next I got a notification telling me that the name I had chosen for the save file already existed (which it did as I did not change the suggested name) and suggested I choose a different name. To get round this I had to delete the existing save file then use the same name when the option is given to choose a name. A save file of the size I chose was then made. This seemed more like a normal pup rather than having a pre-existing save file. Was also slightly confused when I seemed to be given the option of choosing from two types of ext4 file systems. I have not have much time to test yet but I did notice some small things like icons missing from some menu items. Can I thank you and others for the work you've done to get a version of puppy working on the RPi2. PS Have checked md5 checksum and it is correct. Probably not relevent but desktop background is a seagull and not a clock. This gives a 640 by 480 pixel screen. but I haven't tested this. filled up your save file. The amount of space left is shown in lower bar. making the save file bigger if you are a serious user. I've expanded mine to 1.5 gigabytes. Seefurther on for more info about enlarging the save file. a. My desktop PC's monitor is 24-inch, and normally uses 1920x1080 pixel resolution. The TV on which I want to [buy then] use the new RasPi2 is 32-inch; I've no idea what the resolution would be, but no doubt should be greater than my PC's monitor. b. Would the 640x480 pixel screen be auto-magnified to fit, and result in larger text? Yes, the screen becomes very magnified but very clear to view. To compile you will need to enlarge the save file. I recommend 1.5 gigabytes. This contains the software needed for compiling. 2) To enlarge the save file, here are the instructions. 3) Now boot up . There will be seagull on desktop. 6) Click on the devx-*.sfs file, which will mount it. It will take a couple of minutes. Now you can compile. Note the difference in spelling!! Next you need the share name. In this example two shares are available from the same computer. Choose the one you want. Click on 'Connect' and you will be asked a password. It is the Samba password. The folder corresponding to the share will show in the file manager. I have repeated the process. I dragged all the files onto the sd card (as I did the last time) but when I boot up the RPi2 I get the seagull background and not the clock. If I reboot or shutdown the Pi I am asked the same sort of questions as in a nolmal pup when setting up a savefile for the first time. When I get to the point where you check your choises and press to go ahead I again get the comment that file fdsave.ext4 already exists and I should choose another name. As fdsave has an ext4 extention I chose an ext4 file system. The saving action does not appear to take place automaticlly. I don't have enough knowledge to know where to go from here. The downloaded .zip showed the correct md5 checksum but I might try another download unless you have any ideas as to where it's going wrong. I think I have found the problem. I origionally extracted the zip file using a frugal install of Lucid 5287. This is on an ntfs file system. I extracted it onto this system the copied the files over to the sd card. This time I checked the md5 checksum of the zip file again (it was correct) then extracted it directly onto the fat32 formated sd card. I then moved all of the files out of the folder and deleted the folder. This time the RPi2 booted to the clock background and at shutdown the setup changes I made were saved automaticlly. I seem to remember reading that saving files onto an ntfs file system could cause changes such as changing permissions. I don't know If this is true but I do think this could be a problem others might have as I think its quite common to have frugal installs of puppys on ntfs and multi-booting using grub4dos. However it may not be this that caused my initial problem. Thanks for the help. Now it seems to be working correctly I'll do some testing.